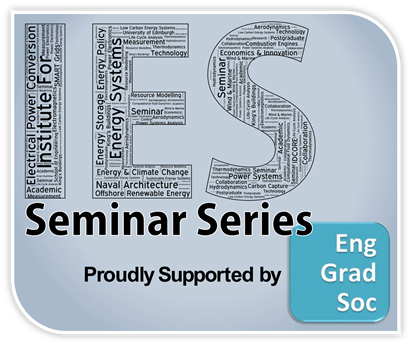 In this talk I will present an overview of the research that I have performed in the last couple of years at the IES. My research is in applied fluid dynamics, and focuses on the viscous flow around immersed bodies. I am particularly interested in those conditions where the nature of the onset flow is turbulent and the forces on the body are due to the formation of vortical flow structures. 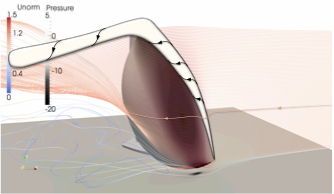 These conditions occur, for instance: (1) on yacht sails, where the sharp leading edge leads to the formation of a large vortex, adding substantially to yacht thrust; (2) on tidal turbine blades, where periodic variations of the current due to the waves lead to the formation of large vortical structures and, in turn, to large load fluctuations and fatigue failure; and (3) on ship hulls, where surface roughness promotes the growth of vortices in the boundary layer and so increases frictional resistance (and energy cost). My research aims to understand and, when possible control, the formation, stability and interaction of such vortices in order to improve cost-performance, efficiency, durability and survivability. Dr Ignazio Maria Viola (www.homepages.ed.ac.uk/iviola) is a Lecturer at the IES and Fellow of the Royal Institution of Naval Architects (RINA). His background is on the fluid dynamics of America’s Cup yachts, a field where his research is internationally leading. He collaborated with four America’s Cup teams and one Olympic team. He has published more than 23 journal papers, 18 as first author, for which he was awarded two RINA Medals of Distinction and one RINA Medal of Exceptional Merit. His research team includes six PhD students as first supervisor and one RA. Ignazio is the coordinator of the Edinburgh Fluid Dynamics Group (fluid-dynamics.uk), which includes more than 60 academics, whose research is related to fluid dynamics, across two Colleges and seven Schools.